Start a new family tradition in the new year, gathering around the table with a delicious and heart-warming Ethiopian style chickpea stew. The Vitamin C in chickpeas functions as a powerful antioxidant and helps protect cells against free radical damage. Chickpeas are also a good source of Selenium, which helps the enzymes of the liver to function properly and detoxify some cancer-causing compounds in the body. Selenium also prevents inflammation and decreases tumor growth rates. Chickpeas additionally contain folate, which plays a role in DNA synthesis and repair, and so helps prevent the formation of cancer cells from mutations in the DNA. Saponins, phytochemicals present in chickpeas, prevent cancer cells from multiplying and spreading throughout the body. 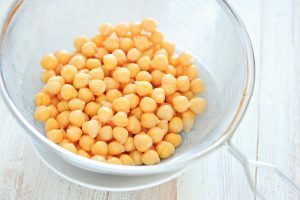 Additionally, the high amount of fiber in chickpeas, as well as other legumes, whole grains, fruits, and vegetables, is associated with a lowered risk of colorectal cancer. The flavorful spices in this recipe, such as cardamom, are powerful phytonutrients and are especially high in manganese, a trace mineral that helps the body form connective tissue. Every spoonful is filled with cancer-fighting benefits for you, and your family. golden brown, 14 to 18 minutes; set aside. 3. Meanwhile, heat remaining 2 tablespoons oil in a pot over medium heat. golden brown, 7 to 10 minutes. 5. Stir in your spice mixture and continue cooking, stirring constantly, until spices are toasted and very fragrant about 2 minutes. 6. Stir in the tomato sauce and cook 2 minutes more. 7. Stir in broth, potatoes, carrots and reserved chickpeas and bring to a boil. 9. Uncover pot and simmer until stew is thickened and potatoes and carrots are very tender, about 25 minutes more. 10. Ladle stew into bowls and enjoy.